Ever since the financial crisis of 2008, economic news from around the world has revealed much of the state of affairs in our world today. From time to time my reaction to some of the reports have appeared as blog posts. Recently I combined some of the more important ones into a single document. 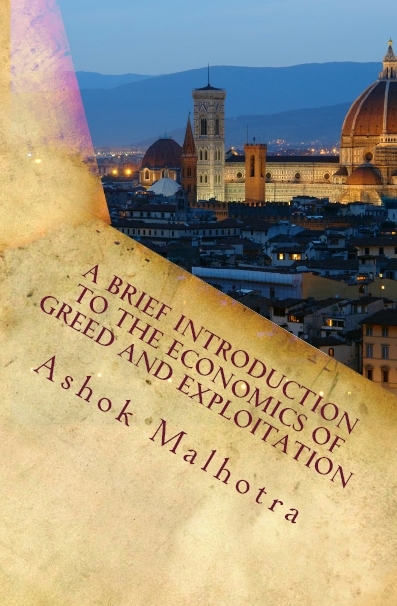 After editing, what emerged was a brief booklet of fifty pages entitled ‘A Brief Introduction to the Economics of Greed and Exploitation’. Driven by insatiable greed, modern economic practices have developed in a manner so that while some executives and bankers walk away with millions of compensation, others are driven out of their homes to the street. At the same time, governments who had freely incurred massive debts with an eye on the next election and a fond hope that economies would continue to grow forever are now staring at mountains of debt. Nations that seek solace in a money printing press are producing inflation that is snatching away bread from the poor man’s table, while the rich laugh all the way to the bank and luxury destinations. As inequalities hit the roof, national economies teeter on the verge of collapse. The ensuing outrage has given rise to phenomenon such as the occupy movement.